Your body naturally maintains a balance of acid and alkaline – measured by pH – and this healthy pH level lets your cells function properly. Proponents of the alkaline diet claim that eating a diet high in fruits and veggies and lower in meat and dairy helps prevent excess acidity that negatively affects your health. 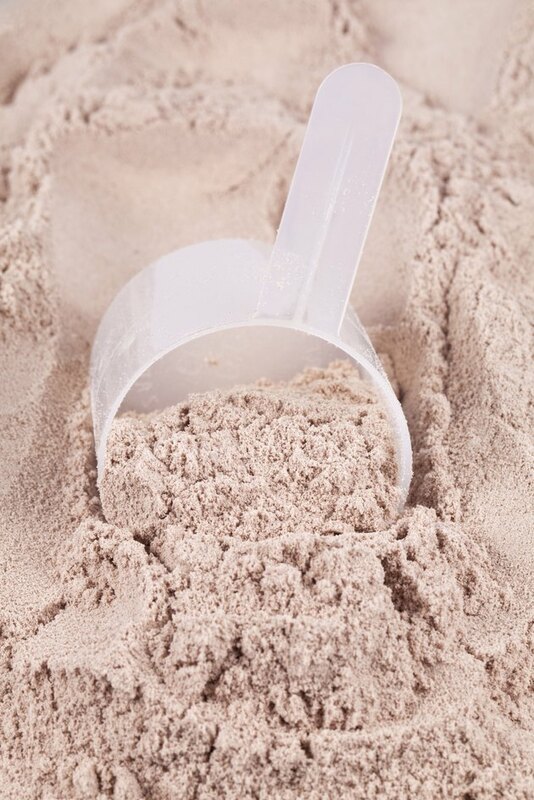 Whey powder isn't an alkaline-forming food, but it can still fit into an alkaline diet. The typical American diet, which is often high in processed foods, sodium, sugar and unhealthy fats, can lead to increased acidity, according to an article written by Gene Bruno, M.S., a nutritionist and dean of Huntington College of Health Sciences. This acidity reduces the effectiveness of antioxidants -- compounds that protect against genetic mutation and cell damage caused by free radicals -- and might weaken your bones. An alkaline diet, on the other hand, might promote bone health, though more research is still needed to know how well this theoretical approach works. An alkaline diet involves focusing on mostly unprocessed, plant-based foods for 70 percent of your diet, and limiting processed foods, meat and dairy to 30 percent of your diet or less. The alkaline diet resource website Acid Alkaline Diet lists whey protein isolate, a purified type of whey protein powder, as weakly acidic. That makes it slightly less acidic that many other types of dairy, including pasteurized milk, sweetened or unsweetened yogurt, paneer and other cheeses. However, it's more acidic than buttermilk, which is an alkaline-forming dairy product. Because the alkaline diet allows up to 30 percent of your food to come from acid-forming foods, whey protein powder can still fit into your diet. And that's a good thing, because it offers several nutritional benefits. In addition to high-quality protein, a serving of whey protein isolate provides half your daily value of A, C, and each of the B-complex vitamins. You'll also get minerals you need for healthy bone tissue, including manganese, phosphorus and calcium. The exact nutritional value of whey protein isolate varies from product to product, though, so check the nutrition label on your favorite powder to gauge its nutritional benefits. Make your protein smoothies using alkaline-forming foods to make your protein shakes alkaline-diet-friendly. Use almond or soy milk -- both of which are alkaline-forming -- instead of dairy milk, and load up your smoothie with alkaline fruits and vegetables, like bananas, figs, kale and spinach. Avoid acid-forming sweeteners, like honey, agave and brown rice syrup, and instead sweeten your smoothie with stevia, with is strongly alkaline. Go Ask Alice: Alkaline Water -- Is It Better for Your Body? What Drink Will Increase the pH Level of My Body? Is Milk Alkaline or Acidic?